Garlic Parmesan Roasted Brussels Sprouts make a quick easy side dish the family will love. 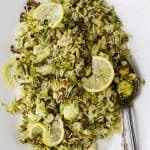 These Brussels Sprouts are tossed with shredded parmesan, loads of garlic and fresh lemon juice for one delicious gluten free recipe! Add brussels sprouts to a food processor or blender. Pulse 5-7 times until the brussels sprouts look shredded. Add brussels sprouts to a large bowl. Drizzle with olive oil, 2 tablespoons of shredded parmesan cheese and minced garlic. Using your hands toss sprouts until the cheese and garlic are combined. Place seasoned sprouts on prepared baking sheet. Bake 20-22 minutes, tossing halfway in between so the sprouts don’t burn. Remove from oven when they are slightly browned. Place in sprouts a large bowl. Add remaining cheese, fresh lemon juice then season with salt to taste. Toss everything together one last time and serve!